Since our launch in 2013, we have grown significantly from word-of-mouth, with our loyal community sharing their experiences and encouraging their friends and family to join them at VMedia. 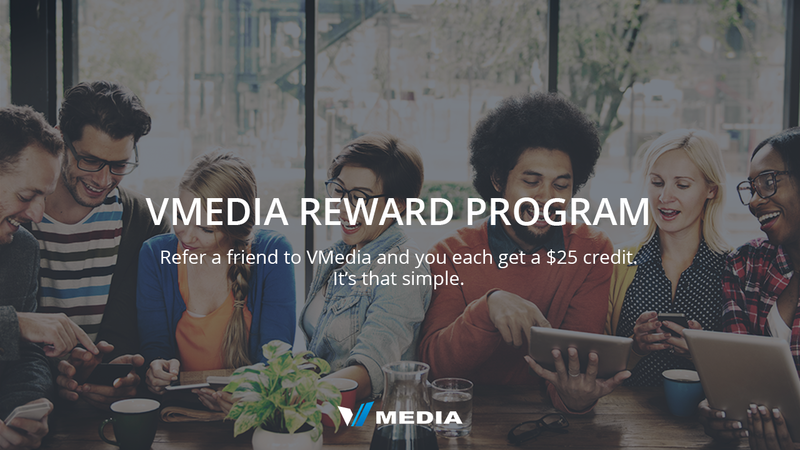 We are very pleased to be able to give back to our great customers and reward them for their support with our VMedia Rewards program. In this easy-to-share program, you will see your personal promo code in your My Account, which you can share with friends and family on social media, or directly via email or person to person. Anyone that uses your code to sign up to any of VMedia’s services receives a discount of $25 immediately when signing up. Once this friend’s first billing cycle is complete, and they become a customer, you will see a $25 credit on your bill. There is no limit on the amount of credits our customers can receive under this program – if you refer one friend consecutively every single month, you will continue to see those $25 credit each month. These Reward credits can be used against monthly services fees for any of our services or new equipment. Our new reward program is our way of giving back to our great community, and is motivated by our mission to provide the most affordable and accessible residential services across Canada. Learn more about our Rewards Program here and share with your friends so they can and should be paying less for unlimited Internet, TV, Home Phone and Home Security.